Landsat 9 will fly near-identical copies of the Operational Land Imager (OLI) and Thermal Infrared Sensor (TIRS) instruments that were flown on Landsat 8. The TIRS instrument will be upgraded to a risk class B implementation, whereas no changes are planned for OLI. With respect to the Landsat 9 project, these instruments will be referred to as OLI-2 and TIRS-2. A diagram of OLI-2 showing its main components. The OLI-2 is a pushbroom sensor. So its focal plane has a long arrays of photosensitive detectors Incident radiation is focused onto the focal plane by a four-mirror anastigmatic telescope. OLI-2 has a 15-degree field-of-view covering a 185 km (115 mi) across-track ground swath. Landsat 9’s photosensitive detectors are divided into 14 modules. There are ~7000 across-track detectors for each OLI-2 spectral band, except the 15-m (49 ft) panchromatic band that has 13,000 detectors. Each spectral band has a specific filter; together the filters are arranged like a “butcher-block” over each module’s detector array. The visible and near-infrared detectors are made from Silicon PIN (SiPIN). The shortwave infrared detectors are made from Mercury–Cadmium–Telluride (MgCdTe). The OLI-2 telescope will view the Earth through its Earth-view baffle. There is a shutter wheel assembly between the Earth-view baffle and the aperture stop. Light enters the telescope via a hole in the shutter wheel during nominal observations. The solar-view baffle is occasionally pointed at the sun so that a diffuser panel can reflect solar illumination into the telescope for calibration purposes. 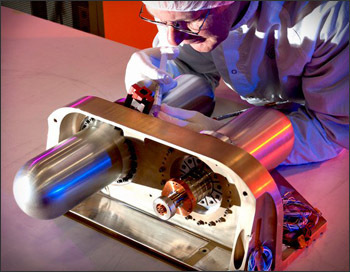 Two lamp assemblies with six small lamps each inside an integrating hemisphere can illuminate the full OLI-2 focal plane through the telescope with the shutter closed as another component of the OLI-2 calibration subsystem. Drawing of the OLI-2 focal plane showing the 14 detector modules; the “butcher-block” filters are the striped black boxes where the upper and lower detector modules meet. 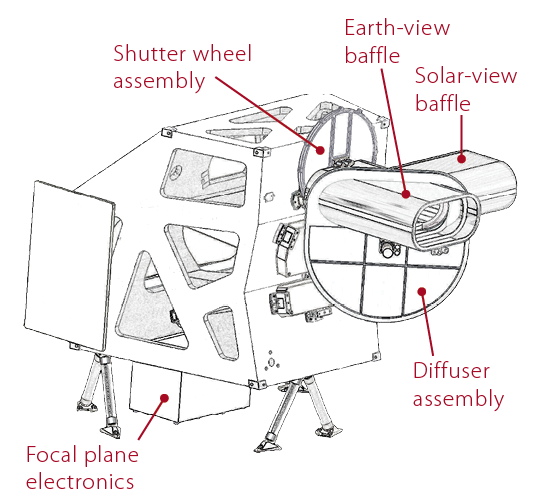 Image credit: Ball Aerospace & Technologies Corp.
A diagram of TIRS-2 showing its main components. The TIRS-2 instrument is a two-band thermal imaging sensor with a push broom sensor (like OLI-2). Its focal plane has long arrays of photosensitive detectors. 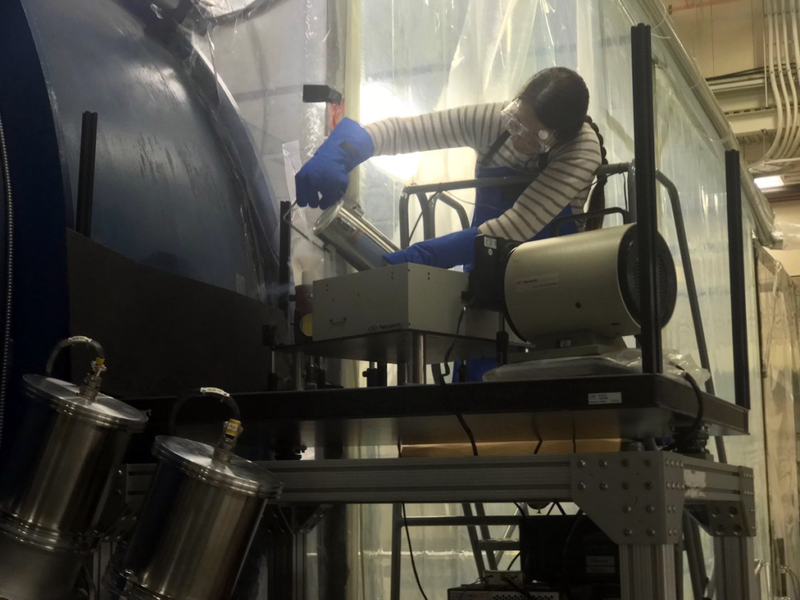 There is a four-element refractive telescope that focuses an f/1.64 beam of thermal radiation onto a focal plane that is cryogenically cooled. TIRS-2 has a 15-degree field-of-view to match the 185 km across-track swath of OLI-2. 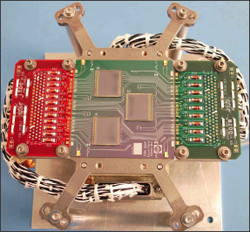 The TIRS-2 focal plane holds three modules with quantum-well-infrared-photodetector (QWIP) arrays arranged in an alternating pattern along the focal plane centerline. Spectral filters cover each focal plane module to create TIRS-2’s two specified bandwidths. Each QWIP array is 640 detectors long cross-track allowing for overlap between the arrays to produce an effective linear array of 1850 pixels spanning across the 185 km (115 mi) ground swath. The field-of-view is flipped between nadir (Earth) and both an internal blackbody and a deep space view used for on-orbit radiometric calibration using a mirror controlled by a scene select mechanism. This allows the view to be changed without changing the nominal earth-viewing attitude of the Landsat 9 spacecraft. 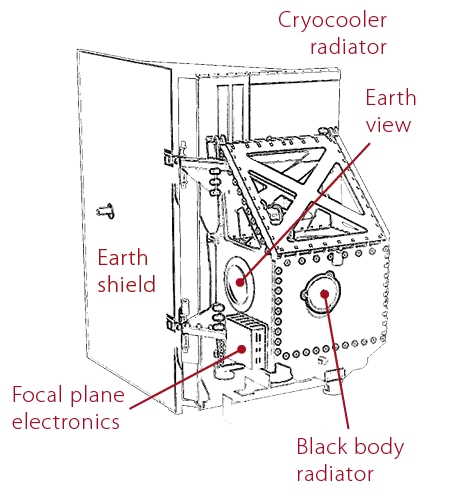 A two-stage mechanical cryocooler will cool TIRS-2’s focal plane. This permits the QWIP detectors to function at their required temperature of 43 K (-382° F/ -230° C). There will be two radiators mounted to the side of the TIRS-2 instrument structure. One dissipates heat from the cryocooler and the other passively maintains a constant TIRS-2 telescope temperature of 185 K (-127° F/ -88° C). A look at the TIRS-2 focal plane: the three squares in the center of the circuit board are QWIPs. Each QWIP can measure 327,680 pixels. The QWIPs on TIRS-2 will detect two narrow segments of the thermal infrared spectrum. The TIRS-2 cryocooler will look like the one above.